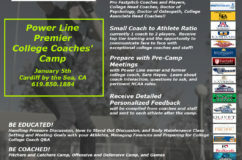 More detailed information about Jan 5 Power Line Premier Camp???? 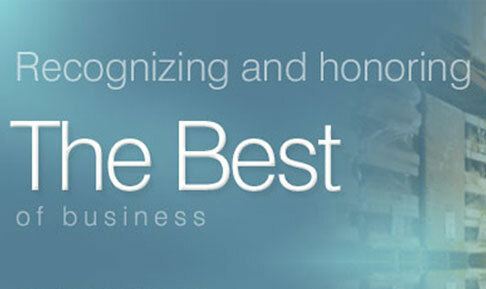 SAN DIEGO June 4, 2015 -- Power Line Athletics has been selected for the 2015 San Diego Award in the Amateur Sports Training category by the San Diego Award Program. 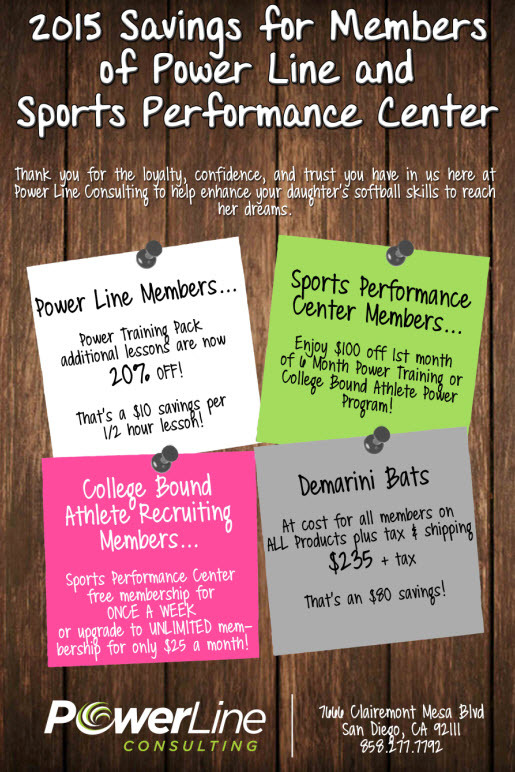 June Specials: 50% Off With Our New Coaches! Sara Hayes had achieved a level of success as a player and coach that many would envy. When she graduated from Notre Dame in 1995, she was the career leader in 10 offensive categories and held eight single-season school records. 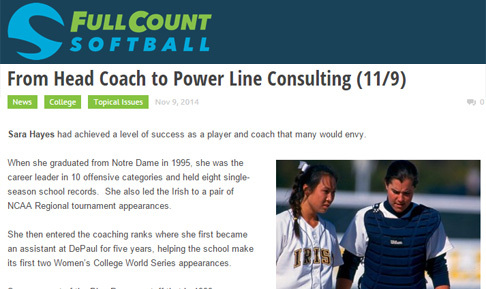 She also led the Irish to a pair of NCAA Regional tournament appearances. She then entered the coaching ranks where she first became an assistant at DePaul for five years, helping the school make its first two Women’s College World Series appearances. Sara was part of the Blue Demons staff that in 1999 was named the NFCA National Softball Coaching Staff of the Year and would soon be offered head coaching opportunities. She ran the softball program at Northern Illinois for two years and then took over at Indiana, where she turned around a Hoosier program that in 2004 had its first winning season in 12 years. The California native longed to return to her West Coast roots, however, and eventually would come back home to coach at Pacific and San Diego State where she oversaw hitting and catching and was heavily involved in recruiting. However, Sara felt that her niche wasn’t in being a coach, but rather in helping young athletes achieve their dreams by connecting them with the right college. She says that in her last year of coaching for the Aztecs she would get 90 to 95 emails a day from kids and parents contacting her to express an interest in being recruited by SDSU, but not really being effective in their approach. Sara saw that the problem was two-fold: too many athletes were not only being effective in targeting the right level of softball programs plus they also were not being trained properly to play at the next level. The former Notre Dame star catcher and outfielder also brought in some talented former softball players and coaches to add to her staff. Becca Heteniak, who was a two-time All-American pitcher and hitter at DePaul after being trained and mentored byDon Sarno of Yorba Linda, and brings a strong understanding of foundational techniques to both pitchers and hitters. Sara decided to concentrate her business in three areas and combine them in one overall package to maximize the opportunity for a player to make it to the next level: the areas include college-bound services, skill development and athletic performance training. 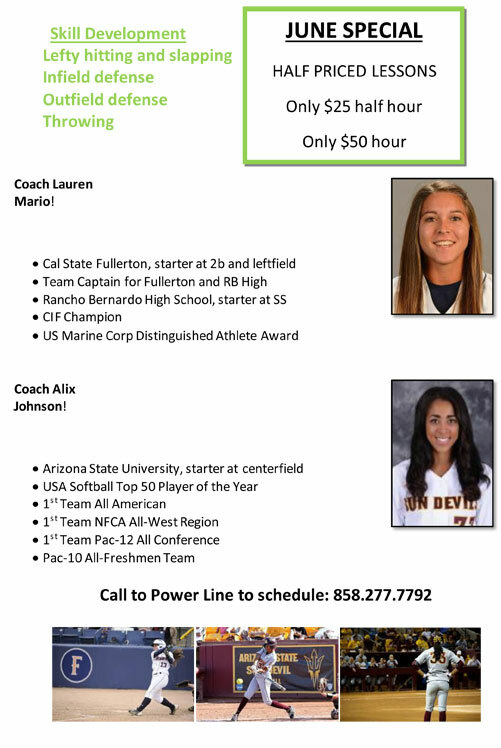 In 2008, Sara and Power Line opened up a 4,300 square foot softball facility in San Diego and this fall built out a 2,000 square foot Sports Performance Center. On the wall of the new facility are the words “Dream Train Succeed” and to the Power Line Consulting team that means providing the synergy of all they have to offer to play softball beyond high school and club ball. The prices are surprisingly reasonable. A group workout can be as low as $10 per session and for a team of five or more athletes runs $199 per person for a six month contract which includes four evaluations, workshops, personal advisement, a skills video and college marketing. The results show that the program is working: 60 athletes have come through Power Line and are playing at the collegiate level. 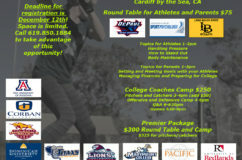 Winter Break Training Program for Current College Athletes! Be a beast when you return to campus for spring season by training with a Power Line Strength & Conditioning Coach in our brand new state of the art facility! Bring your specific college’s winter workout and have our strength and conditioning coaches push you through it. 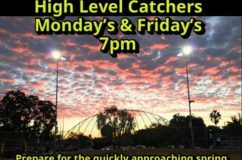 FREE hitting and pitching in any of our cages! 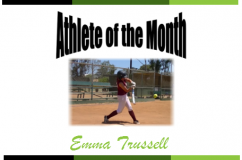 Our August Athlete of the Month is Emma Trussell! She has been a consistent key player on her team, the San Diego Batbusters. She is currently batting a solid .360 with 6 doubles. In her most recent tournaments, she has thrown out more than 50% of runners on steal attempts. She is heading into her junior year at Bonita Vista High School. Since Emma joined our Batbusters team she has solidified the catcher position. She has exceptional defensive skills and has become a force with her bat. She continually outperforms the opposing catchers which is speaks volumes onto itself because of high quality teams that we play. Emma has the ability to make a good pitcher great with her framing and blocking skills as well as calling a great game which is a craft not too many can master at this young age. She’s garnered a lot of college attention this past season through all her hard work and her game has really come together. She’s at the point where she’ll have great choices on where she wants to play at the next level and it’s all due to her playing big in the big games. Congratulations Emma, your selection as “Athlete of the Month” is well deserved!